Adjust and improve your hearing capacities anytime and anywhere without much complexity and with full control. Coming in a very petite and convenient size, this hearing amplifier can be of great help in regaining hearing. The Digital Hearing Amplifier by Britzgo offers many features that users will find accommodating in hearing. First off is its efficient power consumption. Having a 500-hour battery life, Digital Hearing Amplifier by Britzgo allows a long time of usage and quality functioning. As for its functionality, one can easily control and manipulate this hearing amplifier through the one-finger operation feature. Also, it has the Active Digital Noise reduction to soothe and at the same time effectively hear. Using this product for the first time might result in the user experiencing a whistling sound. However, in just a short span of time, this whistling sound will fade away, especially if it perfectly fits. This amplifier also enables customization of the sound. Users can gradually adjust the volume and tone bit by bit but no farther than that. This equipment offers four different modes which are Program 1 (wide Frequency), Program 2 (Low Frequency), Program 3 (High Frequency), Program 4 (Medium Frequency). These modes allow users to utilize the item in different environments and situations without compromising the quality of the sound heard. Style and design is not a problem since the amplifier itself take a minimalist form. You can wear it in your ear and not have a problem doing so. Also, it does not make itself too obvious while wearing it, given its minimalistic design. As for its comfort provided, you will not have a problem wearing this, since it is very lightweight. It also comes with a rotatable earpiece to let you use it for either ear. Digital Hearing Amplifier by Britzgo comes in a U-shaped kind of bar with the hearing bud and tube at one end. This makes it easy to fit in any ear. This hearing amplifier is very lightweight, easy to use, and easy to carry around. It also has a simple yet very classy kind of design, fitting any fashion and circumstances. Allows adjustments regarding frequency to adjust to different situations or hearing environment. It has a very long battery life for more prolonged use. It has a feature that allows the earpiece to fit either ear, for the convenience of the user. This adjustable part makes it also useful in adjusting the ear tube correctly to the user’s size. Once the battery’s energy drains out, you cannot recharge it and use it any longer. This would also mean that you’d have to spend for another set of hearing amplifiers. It does not have a noise-canceling technology. This causes the user at some point to pick up and hear everything in the environment. Once the hearing amplifier is availed, the customer is entitled to a package. The said package contains a piece of the Britzgo Premium Digital BHA-220 Modern Blue hearing amplifier and a traveling case. To better care for the amplifier, there are also additional items in the package. These include two pieces of P675 batteries, a cleaning brush, and three domes—for small, medium and large sizes. An instruction manual also comes with the package to help users gain a better understanding of the item and its proper care and use. On top of the rich and useful inclusions of the package, customers loved this item for its affordable price that is even slashed down to a lower one. This makes the Digital Hearing Amplifier by Britzgo one of the most inexpensive yet very effective hearing amplifiers in the market. This product is highly recommended for those looking for an efficient yet inexpensive kind of hearing amplifier. Considering its worth of money and the length of time one can use this amplifier, this one is a rare and excellent item. Unlike other brands having nearly the same price as the Digital Hearing Amplifier by Britzgo already offers a lot. This one is also a good find for those who are looking for a long-lasting yet straightforward hearing amplifier. Taking into consideration the number of operating hours, this amplifier already offers a very long time of service to the user. Its long-term battery life also makes it a lot more useful for many users and gives their money more worth. Given the excellently long battery life, they will have a long time to save up for another. People who are looking for style along with efficiency are also one of the best customers of this equipment. It lets them use this product without much worry whether it will be noticeable or not—or even if it suits their fashion style or not. Given its minimalistic design yet classy appearance, users can wear this for any occasion and match any outfits. 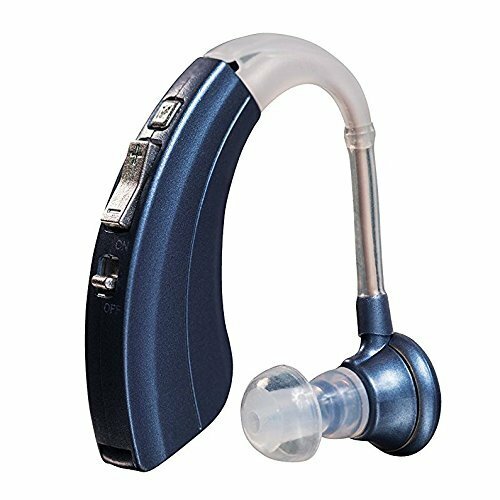 This product undeniably has excellent and beneficial features for those who need help in improving their hearing. From the worth of money to its functions, the convenience it using, its adjustable qualities and even to its presentation—there are reasons to buy and use this item. However, despite all these promising features, one must also consider the dangers and inconveniences that will come along in using the product. Undoubtedly, the product enhances hearing, and there are adjustments as to how much you’d like to hear. Nevertheless, keep in mind the diverse effects of the malfunctions that this hearing amplifier may exhibit. Different people have different demands and tolerance in hearing improvement equipment. For example, if you or your loved one who will use the hearing amplifier will find the cons extremely inconvenient, then think of this choice again. Overall, the Digital Hearing Amplifier by Britzgo is a decent hearing improvement equipment at a very affordable price. It is worth a try for those wishing to hear better without many monetary expenses and complexity.